441010 RR 151-14, RR 181-14 ABB turbocharger RR 151-14, RR 181-14 Instruction Manual (Operation, Service, Spare parts). 441012 RR 150 / RR 180 / RR 212 ABB turbocharger RR 150 / RR 180 / RR 212 Instruction Manual (Operation, Service, Spare parts). 441014 RR 181-14 ABB turbocharger RR 181-14 Instruction Manual (Operation, Service, Spare parts). 441052 TPL 61 -A.. - 65 A ABB turbocharger TPL 61 -A.. - 65 A Instruction Manual (Operation, Service, Spare parts). 441054 TPL 61, TPL 65 ABB turbocharger TPL 61, TPL 65 Instruction Manual (Operation, Service, Spare parts). 441056 TPL 65A_-10 ABB turbocharger TPL 65A_-10 Instruction Manual (Operation, Service, Spare parts). 441058 TPL 65A_-30 ABB turbocharger TPL 65A_-30 Instruction Manual (Operation, Service, Spare parts). 441060 TPL 67-C33 ABB turbocharger TPL 67-C33 Instruction Manual (Operation, Service, Spare parts). 441062 TPL 69 -A...- 85 -A ABB turbocharger TPL 69 -A...- 85 -A Instruction Manual (Operation, Service, Spare parts). 441064 TPL 69-A30 ABB turbocharger TPL 69-A30 Instruction Manual (Operation, Service, Spare parts). 441066 TPL 73-A30 ABB turbocharger TPL 73-A30 Instruction Manual (Operation, Service, Spare parts). 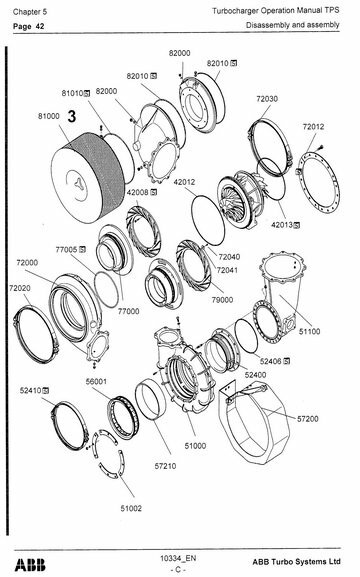 441068 TPL 73-B, TPL 77-B, TPL 85-B, TPL 80-B ABB turbocharger TPL 73-B, TPL 77-B, TPL 85-B, TPL 80-B Instruction Manual (Operation, Service, Spare parts). 441070 TPL 77-A30 ABB turbocharger TPL 77-A30 Instruction Manual (Operation, Service, Spare parts). 441072 TPL80-B12 ABB turbocharger TPL80-B12 Instruction Manual (Operation, Service, Spare parts). 441074 TPL 80-B (HYUNDAI) ABB turbocharger TPL 80-B (HYUNDAI) Instruction Manual (Operation, Service, Spare parts). 441076 TPL 85-B11 ABB turbocharger TPL 85-B11 Instruction Manual (Operation, Service, Spare parts). 441078 TPL 85-B15 ABB turbocharger TPL 85-B15 Instruction Manual (Operation, Service, Spare parts). 442002 TPS 48 - 61 ABB turbocharger TPS 48 - 61 Instruction Manual (Operation, Service, Spare parts). 442004 TPS48-61D/E/F.pdf ABB turbocharger TPS48-61D/E/F.pdf Instruction Manual (Operation, Service, Spare parts). 442006 TPS 48 .... 61 ABB turbocharger TPS 48 .... 61 Instruction Manual (Operation, Service, Spare parts). 442008 TPS 48-E01 ABB turbocharger TPS 48-E01 Instruction Manual (Operation, Service, Spare parts). 442010 TPS 48-E01_-SISO01 ABB turbocharger TPS 48-E01_-SISO01 Instruction Manual (Operation, Service, Spare parts). 442012 TPS 48-SISO01 ABB turbocharger TPS 48-SISO01 Instruction Manual (Operation, Service, Spare parts). 442014 TPS 52 ABB turbocharger TPS 52 Instruction Manual (Operation, Service, Spare parts). 442016 TPS 52 E01 ABB turbocharger TPS 52 E01 Instruction Manual (Operation, Service, Spare parts). 442018 TPS 52 E01 SISO06 ABB turbocharger TPS 52 E01 SISO06 Instruction Manual (Operation, Service, Spare parts). 442020 TPS 52 F32 ABB turbocharger TPS 52 F32 Instruction Manual (Operation, Service, Spare parts). 442022 TPS 52 F32 SISO06 ABB turbocharger TPS 52 F32 SISO06 Instruction Manual (Operation, Service, Spare parts). 442024 TPS 57 E01 ABB turbocharger TPS 57 E01 Instruction Manual (Operation, Service, Spare parts). 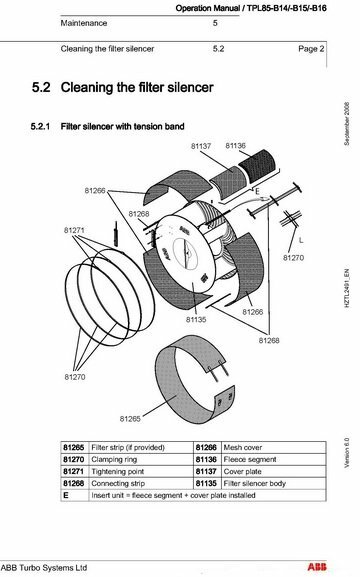 442026 TPS 57 E01 SISO05 ABB turbocharger TPS 57 E01 SISO05 Instruction Manual (Operation, Service, Spare parts). 442028 TPS 57 E01 SSDF01 ABB turbocharger TPS 57 E01 SSDF01 Instruction Manual (Operation, Service, Spare parts). 442030 TPS 57 E01 SSDF02 ABB turbocharger TPS 57 E01 SSDF02 Instruction Manual (Operation, Service, Spare parts). 442032 TPS 57 E01 STPS11 ABB turbocharger TPS 57 E01 STPS11 Instruction Manual (Operation, Service, Spare parts). 442034 TPS 57 E01 STPS15 ABB turbocharger TPS 57 E01 STPS15 Instruction Manual (Operation, Service, Spare parts). 442036 TPS 57 E01 STPS16 ABB turbocharger TPS 57 E01 STPS16 Instruction Manual (Operation, Service, Spare parts). 442038 TPS 57 F32 ABB turbocharger TPS 57 F32 Instruction Manual (Operation, Service, Spare parts). 442040 TPS 57 SISO 03 Special Design ABB turbocharger TPS 57 SISO 03 Special Design Instruction Manual (Operation, Service, Spare parts). 442042 TPS 57 SSDF02 ABB turbocharger TPS 57 SSDF02 Instruction Manual (Operation, Service, Spare parts). 442044 TPS 57-E01 SSDF01 ABB turbocharger TPS 57-E01 SSDF01 Instruction Manual (Operation, Service, Spare parts). 442046 TPS 57-E01 STPS10 ABB turbocharger TPS 57-E01 STPS10 Instruction Manual (Operation, Service, Spare parts). 443002 VTC 214-13 ABB turbocharger VTC 214-13 Instruction Manual (Operation, Service, Spare parts). 443004 VTC 254A-13 ABB turbocharger VTC 254A-13 Instruction Manual (Operation, Service, Spare parts). 444002 VTR 161-4 W3P7S ABB turbocharger VTR 161-4 W3P7S Instruction Manual (Operation, Service, Spare parts). 444004 VTR 161-4 WBPS ABB turbocharger VTR 161-4 WBPS Instruction Manual (Operation, Service, Spare parts). 444006 VTR 161, 201, 251 WP IHI-BBC ABB turbocharger VTR 161, 201, 251 WP IHI-BBC Instruction Manual (Operation, Service, Spare parts). 444008 VTR 184 -11_-21 ABB turbocharger VTR 184 -11_-21 Instruction Manual (Operation, Service, Spare parts). 444010 VTR 184 P-11 ABB turbocharger VTR 184 P-11 Instruction Manual (Operation, Service, Spare parts). 444012 VTR 200 ABB turbocharger VTR 200 Instruction Manual (Operation, Service, Spare parts). 444014 VTR 200 W3PR ABB turbocharger VTR 200 W3PR Instruction Manual (Operation, Service, Spare parts). 444016 VTR 200 W3PS ABB turbocharger VTR 200 W3PS Instruction Manual (Operation, Service, Spare parts). 444018 VTR 201-2 W3PS ABB turbocharger VTR 201-2 W3PS Instruction Manual (Operation, Service, Spare parts). 444020 VTR 214-11 ABB turbocharger VTR 214-11 Instruction Manual (Operation, Service, Spare parts). 444022 VTR 214 -11_-21 ABB turbocharger VTR 214 -11_-21 Instruction Manual (Operation, Service, Spare parts). 444024 VTR 250 ABB turbocharger VTR 250 Instruction Manual (Operation, Service, Spare parts). 444026 VTR 251-2 W3P RUS ABB turbocharger VTR 251-2 W3P RUS Instruction Manual (Operation, Service, Spare parts). 444028 VTR 251-2 W3PR ABB turbocharger VTR 251-2 W3PR Instruction Manual (Operation, Service, Spare parts). 444030 VTR 254-11 L141_T011 ABB turbocharger VTR 254-11 L141_T011 Instruction Manual (Operation, Service, Spare parts). 444032 VTR 254 -11_21 ABB turbocharger VTR 254 -11_21 Instruction Manual (Operation, Service, Spare parts). 444034 VTR 254 P -11_-21 ABB turbocharger VTR 254 P -11_-21 Instruction Manual (Operation, Service, Spare parts). 444036 VTR 304-11 ABB turbocharger VTR 304-11 Instruction Manual (Operation, Service, Spare parts). 444038 VTR 304-11_-21 ABB turbocharger VTR 304-11_-21 Instruction Manual (Operation, Service, Spare parts). 444040 VTR 304 -32 _-42 ABB turbocharger VTR 304 -32 _-42 Instruction Manual (Operation, Service, Spare parts). 444042 VTR 304 - 11 SSLG01 ABB turbocharger VTR 304 - 11 SSLG01 Instruction Manual (Operation, Service, Spare parts). 444044 VTR 304 P -11_-21 ABB turbocharger VTR 304 P -11_-21 Instruction Manual (Operation, Service, Spare parts). 444046 VTR 304 P_-11 ABB turbocharger VTR 304 P_-11 Instruction Manual (Operation, Service, Spare parts). 444048 VTR 320 W3P RUS ABB turbocharger VTR 320 W3P RUS Instruction Manual (Operation, Service, Spare parts). 444050 VTR 321-2 w3p ABB turbocharger VTR 321-2 w3p Instruction Manual (Operation, Service, Spare parts). 444052 VTR 354-11_-21 ABB turbocharger VTR 354-11_-21 Instruction Manual (Operation, Service, Spare parts). 444054 VTR 354 P11 ABB turbocharger VTR 354 P11 Instruction Manual (Operation, Service, Spare parts). 444056 VTR 354 P-11_-21 ABB turbocharger VTR 354 P-11_-21 Instruction Manual (Operation, Service, Spare parts). 444058 VTR 454-32 ABB turbocharger VTR 454-32 Instruction Manual (Operation, Service, Spare parts). 444060 VTR 454-32 SLGD01 ABB turbocharger VTR 454-32 SLGD01 Instruction Manual (Operation, Service, Spare parts). 444062 VTR 454 P11 ABB turbocharger VTR 454 P11 Instruction Manual (Operation, Service, Spare parts). 444064 VTR 501-2 ABB turbocharger VTR 501-2 Instruction Manual (Operation, Service, Spare parts). 444066 VTR 564 D -32 ABB turbocharger VTR 564 D -32 Instruction Manual (Operation, Service, Spare parts). 444068 VTR 631-1 WZ4 ABB turbocharger VTR 631-1 WZ4 Instruction Manual (Operation, Service, Spare parts).